Leave your preconceptions at the door and challenge the ordinary as you mix up a scintillating cocktail of colour on this exciting 1-day practical workshop. Revolutionise the way you think and see by experimenting with daring combinations and exploring a decadent new world of tantalising textures and cosmetic concoctions. Once you have attended this workshop you’ll never be cautious with colour again. Click here for more info. Discover the secret make-up techniques that are aloft in the alternative, mysterious world of the seductive boudoir circus. 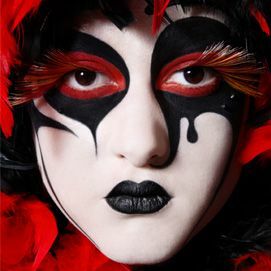 Circus make-up artistry is at the height of technicality, and the Boudoir Circus Starlet course provides you with a make-up challenge to improve both your creativity and line work. Click here for more info. The ultimate make-up education programme, this professionally designed intensive course will provide you with a solid platform from which to build your confidence and your skills. You’ll learn and practice a range of core technical and creative techniques until you’re precision perfect, then look at ways in which to develop more abstract styles and looks. This comprehensive introduction to professional make-up will teach your alter ego everything it needs to know about self-expression. Click here for more info. Here a just a few of the amazing courses available to professionals. Other courses included in 25% offer are the Creative Couture Lash Workshop, Building Expertise & Confidence – Perfecting Eye Design, Building Abstract Creativity – Art & The Alter Ego Course, Bridal & Beyond Course, Building Creativity, Building Creativity – Vintage Glamour Course. To book please email school@illamasqua.com or call the store on 0203 4323276. Make that New Years resolution a reality and enroll on one of our courses!